“I really didn’t know how to start this caption and while I started writing, tears flowed from my eyes. I realise that I’m either very lucky, or someone was watching out for me Saturday. “I cry because I know what the people who truly care about me went through and when I heard my dad’s voice on the phone I couldn’t stop crying. I heard the shock, sadness, pain, and relief all at once,” Campbell said in the caption of a short clip of himself walking with medical personnel at the health facility. “For those who don’t know me, I push myself hard in practice and give nothing but my best in whatever I’m doing. As athletes we train to push our bodies beyond its normal limits. 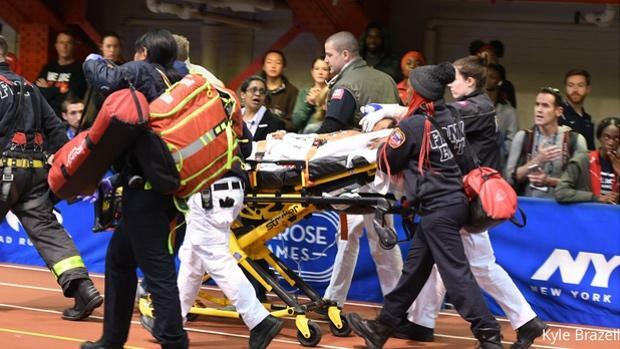 Until my heart stopped at Millrose Games on Saturday, I don’t remember any of it…” he said. “It’s been tough, not physically, but mentally, it has been a battle,” he added. Campbell’s update follows an outpouring of support from well-wishers here and in the Diaspora. A GoFundme campaign that was launched to assist with his medical expenses had raised US$46,436 of the US$200,000 target at the time of this publication. The Government through Minister of Culture, Gender, Entertainment and Sport, Olivia Grange yesterday disclosed that contact has been made with the athlete’s family and management and arrangements are being made to assist with his medical expenses. Preceding that announcement, President of Reebok, Matt O’Toole told Sports Illustrated yesterday that the sportswear company will be donating USD$50,000 to assist with the medical expenses for the professional distance runner as well.